Time flies when you're having fun! I can hardly believe that my sweet baby Cupcake is now a two year old. I am incredibly proud of her budding little personality. She is such a little smarty-pants and has truly brought oodles of joy into our little family. 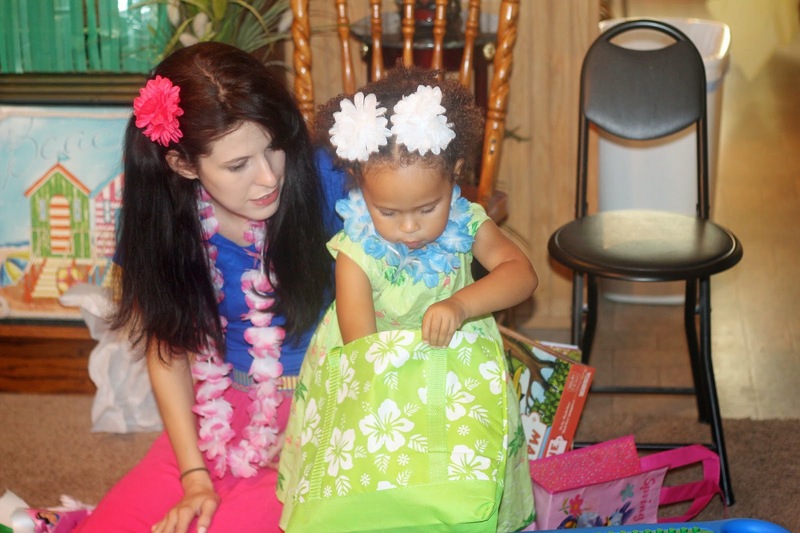 In honor of her journey into toddlerhood, we hosted her a luau at Nana and Papa's house. My goal was to keep the party relatively low-budget. 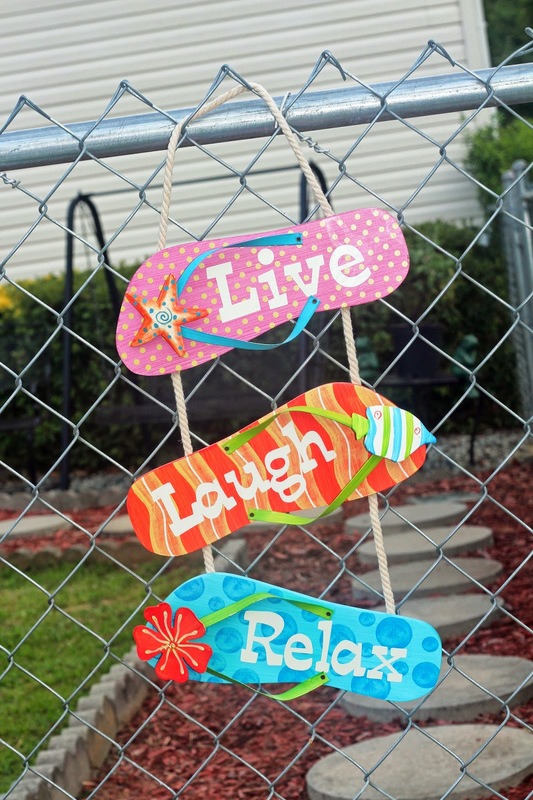 Thus, most of the items were DIY projects, thrift, or Dollar Store finds. This framed chalkboard was a DIY project created with a Goodwill photo frame and chalkboard paint (if you follow me on Facebook you already know I am obsessed with chalkboard paint). It greeted the guests and was surrounded by gifts...and a random pineapple! 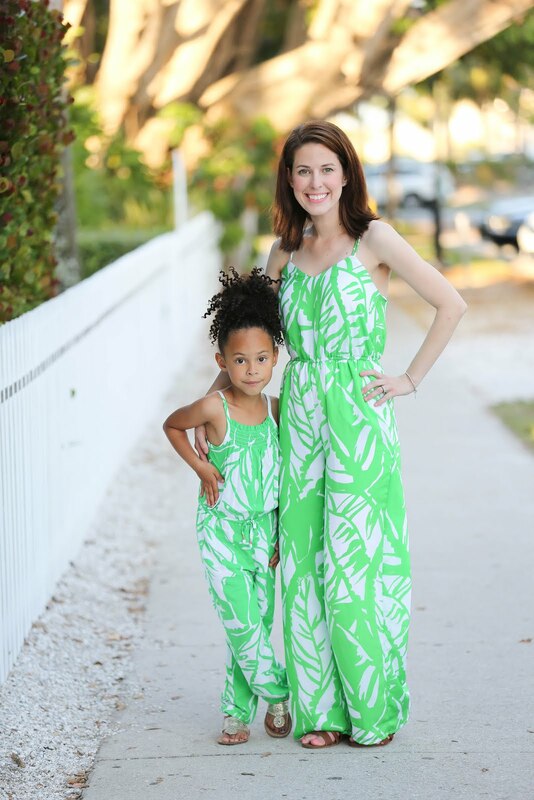 I purchased tropical background music from Amazon. 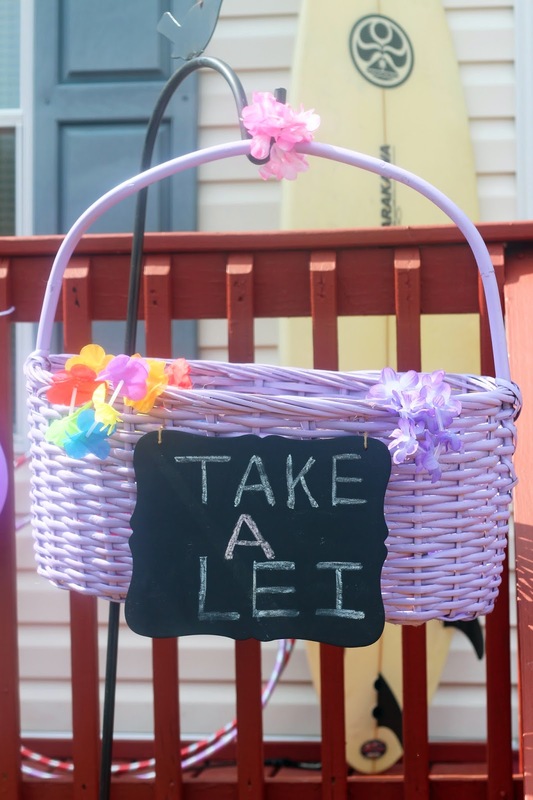 Outside the front door hung a large basket filled with leis for the guests to wear at the party. The basket was one that I picked up at a yard sale and painted last Easter. 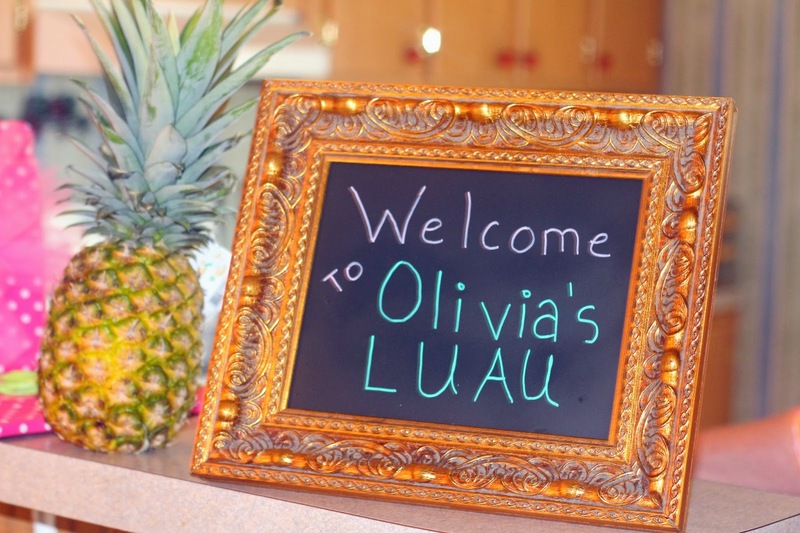 The chalkboard sign was purchased in the craft department at Walmart. I hung the basked from a plant hanger that my parents already had in their front yard. 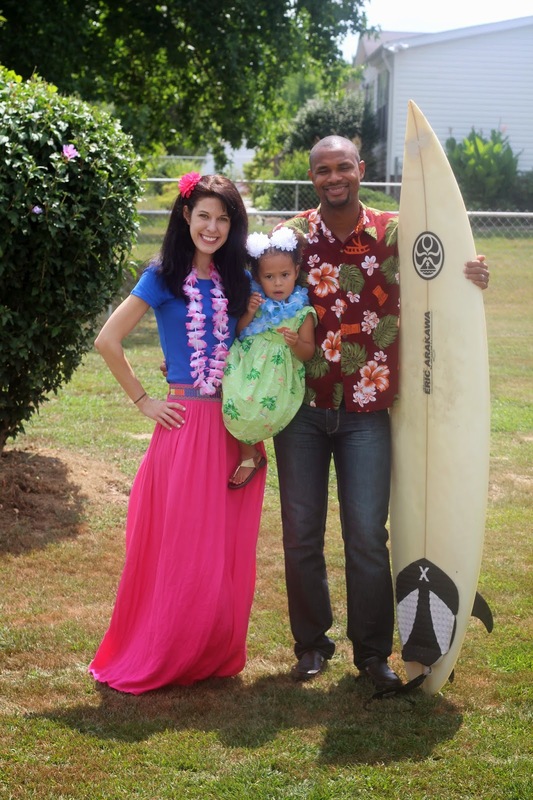 As the guests arrived, I took a quick photo of them holding a large decorated picture frame or a surf board. 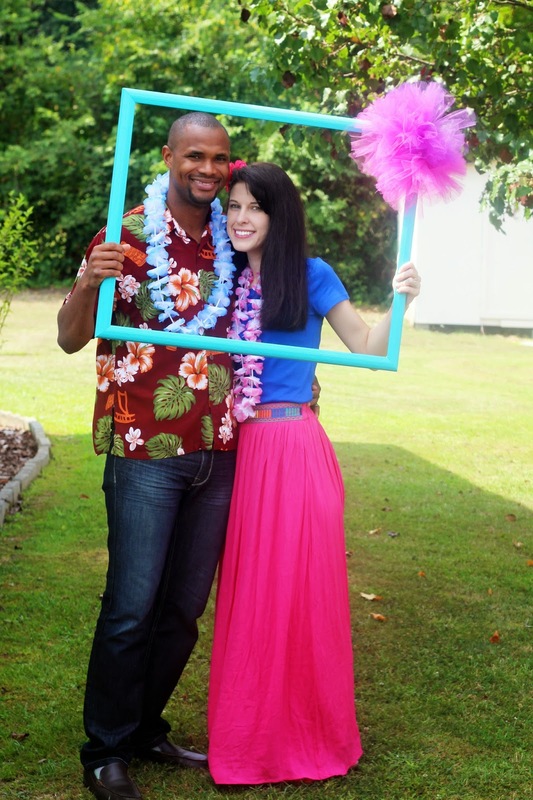 I created the frame photo prop by removing the glass from an old panting I purchased at Goodwill, painting it Seafoam Green, and attaching a large tulle puff (this was made using the method demonstrated in the tulle puff headband post). The surf board was borrowed from my brother. 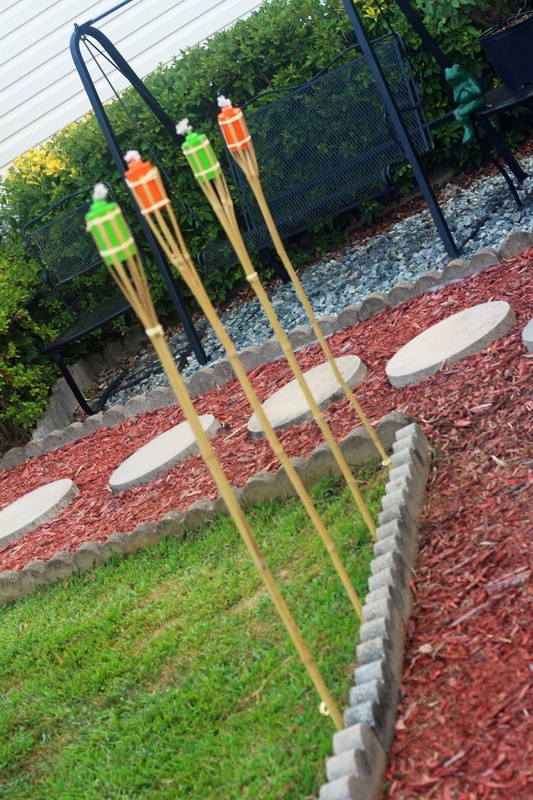 These adorable bamboo torches were a lucky find at the Dollar Store! 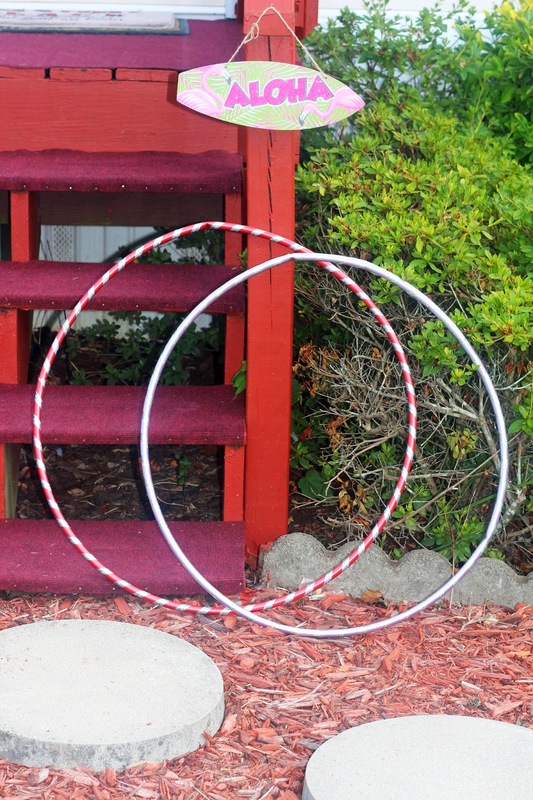 I used them to line the walkway into the house. 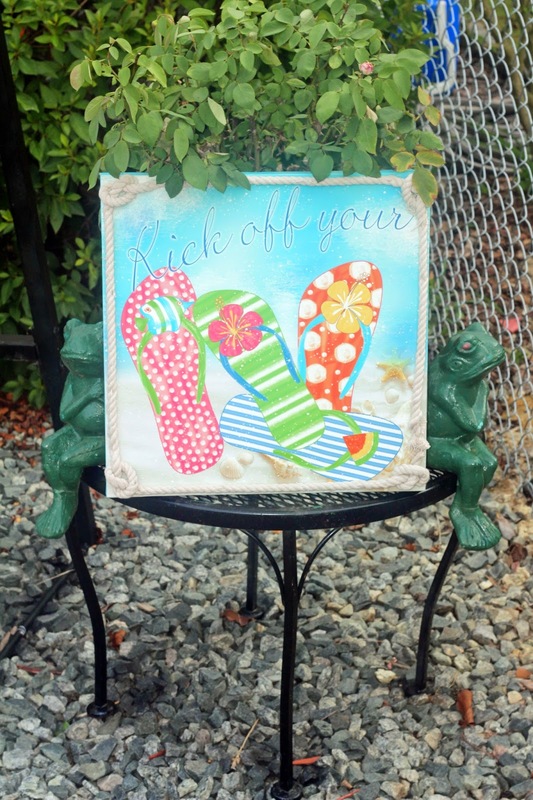 A "Kick Off Your Flip Flops" sign was placed on a small lawn table near the entrance. 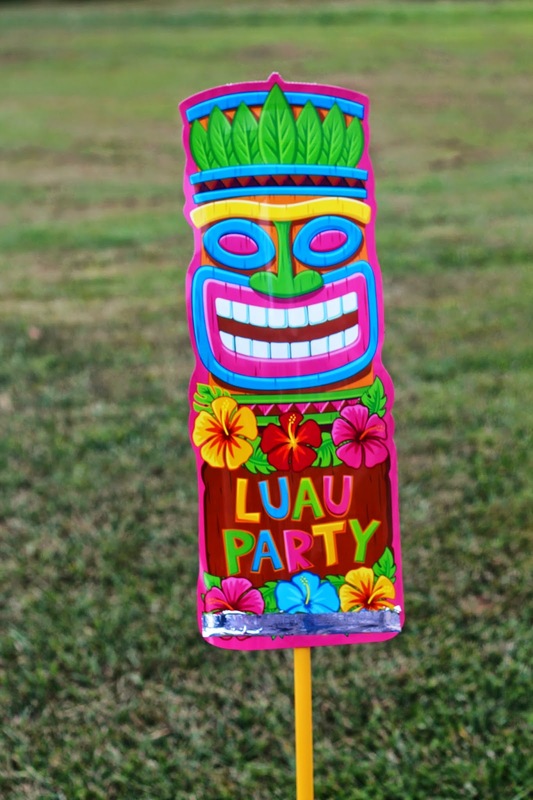 The yard was decorated with a variety of Hawaiian themed items that I had been collecting for several months. Most of these items were found while thrifting or at the Dollar Store. I wanted the atmosphere to be as beachy as possible! 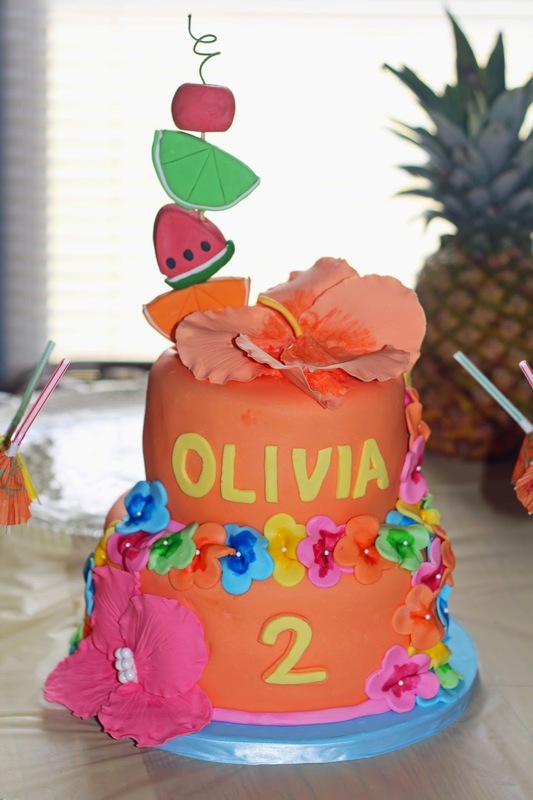 No party is complete without a fantastic cake! This gorgeous and positively delicious cake was created by Yum! Cakes. I could not have been more pleased with how it turned out. 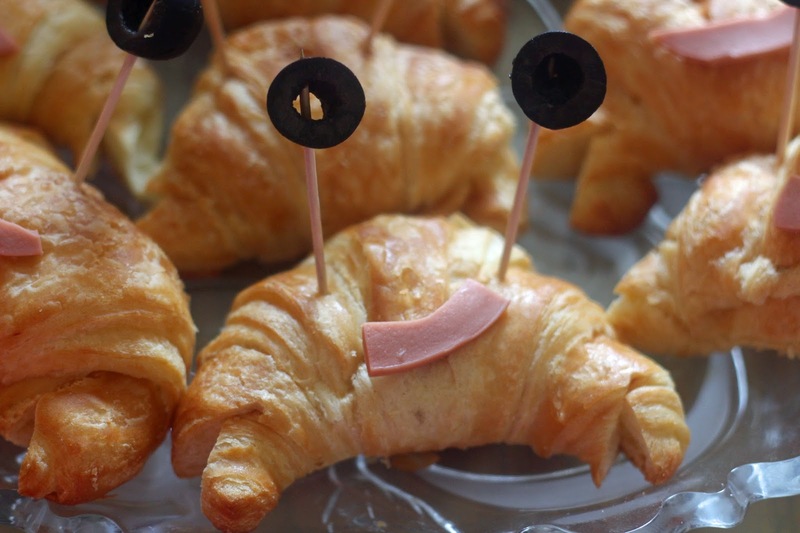 The menu included these fun little "crab-wiches" which were made out of croissants, black olives, and vegetarian bologna. I snipped the ends to create the claws. The yummy and refreshing citrus punch made by my lovely mother. 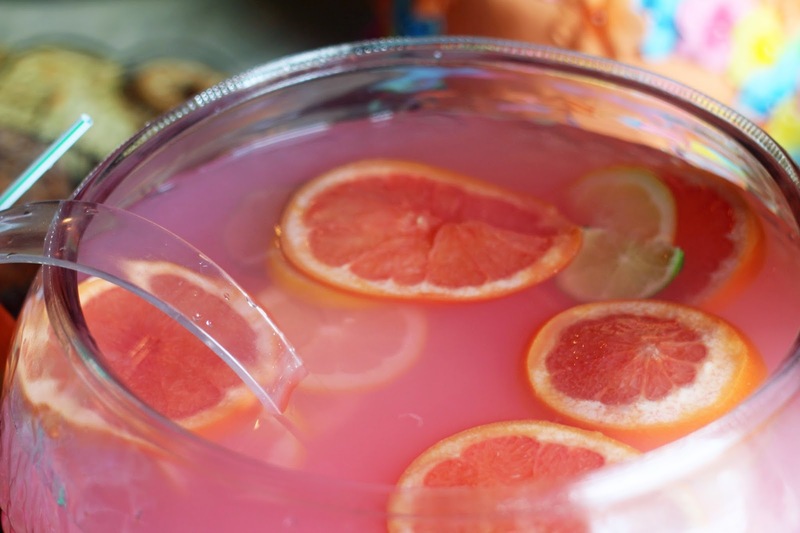 We froze lemon, lime, and grapefruit slices and floated them in the punch. 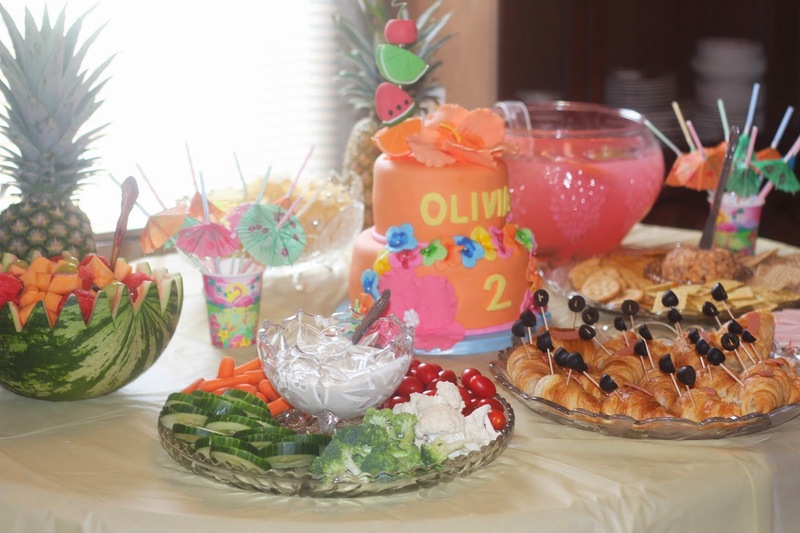 We also served a vegetable and dip tray, fresh fruit in a carved watermelon bowl, assorted crackers, and cheese balls. In the living room, a large wooden bowl of kettle corn was enjoyed by all. All guests were given a number when they arrived and the chosen number received a fresh pineapple as a door prize. The hula hooping competition was a favorite, and the winner received an inflatable parrot. I am so thankful for the many guests who made the event such a pleasure! We had such a lovely afternoon celebrating the first two years of life for my beautiful baby girl.